Our True Father, Rev. 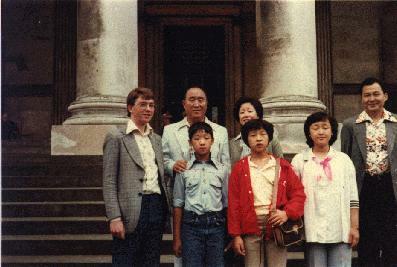 Sun Myung Moon, came to Washington DC with True Mother on Friday September 17, 1999. I got a call as a Washington region community leader to come and greet them, so I left from work and came to Jefferson House as they were eating lunch. After lunch, other church leaders and I were waiting in the living room to greet True Parents. When they came in, we bowed, and they sat down on cushions on the floor. Father spoke for about an hour. Some time during this period, Mother left the room, and then Father asked various people to sing. After some time singing, Father said goodbye to everyone, and left. Most people left at this point. Downstairs, Peter Kim and Tim Elder were trying to find the Korean and English copies of the speech God's Fatherland from the book God's Will and the World. Father was planning to give this speech at the Second International Hoon Dok Seminar at the Sheraton National Hotel in Arlington, Virginia at the closing banquet. Father had told us that he was not planning to come to the conference, but that Hurricane Floyd changed his travel plans. They were not happy with the English translation in the book, so they wanted to retranslate the original Korean. However, when we went to the Korean UC web site, it was not available unless we were registered somehow. That posed a problem. So, we found someone with the Korean CD-ROM of True Parents' speeches and attempted to read it from there. The problem was that the CD is encrypted. After much trouble, I got it to work, and we cut and pasted the speech into the Korean word processor, and we were good to go. By this time it was time for dinner, and several of the Korean sisters were telling the others to go up for dinner. I asked Rev. Lee if it was okay for me to eat with Father, so he said to go ahead. We came into the dining room and did a full bow to True Parents. Then someone prayed and we began dinner. There was Rev. In Hoi Lee Washington DC regional director, Rev. Oh from UTS, Rev. Peter Kim Father's assistant and translator, Tim Elder a gifted linguist and myself the computer guy, and True Parents. We had Korean barbecue pork ribs, rice, and various side dishes. For some time we ate in silence, or Tim Elder and True Parents spoke in Korean. After a while, Peter Kim explained that they were joking with Tim and testing his Korean. Then Mother finished eating and left, and Rev Lee left too. So there we were, four brothers, eating with True Father, the Messiah, the man who will recreate human history. What do you say in a situation like that? I thought to myself of all the things I would like to ask Father if I had the chance, but I did not want to ask him anything stupid or trivial. I had this opportunity once before and had asked a significant question, but this time, I was wracking my brain for a good one. It made me realize that in my life of faith, I need to have a strong pressing question always uppermost in my mind so that if I get the opportunity, I can ask it of God's representative. What would you ask? On another occasion in September 1996, I had been at the table with Father in Anchorage, Alaska and I had asked him the question "Why is it so hard for us to be good?" referring to the struggle we have in our mind and body to follow God's will. He said that it is because we have inherited the Satanic blood lineage. Although his answer was simple, it encapsulates so much of Father's teaching, that we became controlled by evil due to becoming part of Satan's lineage. Concerned that he would get up and leave and that I would lose the fleeting moment, I asked Father "Do you expect any great changes in the year 2000?" He said that the year 2000 will mark the beginning of the era of the True Family ideal. Young people will turn to a life of faith and the PLA and UC will get the reputation for being the place where you can find a good virgin wife. He also said that he has been criticized a great deal for saying that the era of democracy will end, but that it is true. I asked "What will replace democracy?" He said "It will be some kind of system based on the ideal of the True Family." There was another lull. Then I said "Father, I want you to know that every day, I send your speeches out to thousands of people via the Internet." He seemed very pleased and then after a moment he asked "Why did you get start learning about the Internet?" "For witnessing", I replied. "I saw it as having great potential to teach the world." "But why did you get involved in computers?" he persisted. I told him "Do you remember visiting Cambridge University back in 1978 with True Mother and Heung Jin Nim and In Jin Nim and one of the other daughters?" "Un Jin", he said, "I remember." "You met a skinny looking college student that day, and Neil Salonen took a picture of us on the steps of the Fitzwilliam Museum. That was me. 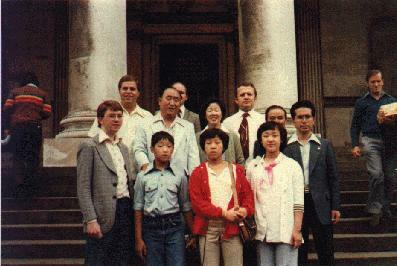 Col. Han was there that day too." "Then in 1983, while I was at UTS, you came there fishing one day, and Col. Han was with you too, and he remembered me and asked if I had ever gone on to do a PhD degree. I said that I hadn't and in fact I was wondering what to do next after UTS. He said "I'll go and ask Father", so he did. He came back and said "Yes, he thinks that you should go for a PhD." "What should I study? ", I asked, and he said "Something in technology"". "So, after graduating from UTS, I came to Washington and studied computer science, and I have been developing my skills in the field ever since." Then Father said, "Then you should be grateful to me. ", and I replied, "Yes, Father, I am grateful to you." He asked "What kind of work do you do with computers?" I replied "I write software. For example, when I was at FAA, I wrote software for air traffic management. Now I work for NASA and I write software for a system which processes images from space. For example, I could get you pictures from space of the land you have in Jardim, or the Pantanal." Father asked about the pictures, and I explained that they are taken from 200 miles up in space, and have a resolution of 15 meters. He said he would like an image of the whole Pantanal wetland for the Pantanal Conference on October 15, 1999. I told him I would do my best to get him an image. Father suggested that I get into business and that I use the Internet to sell goods, information and services. He spoke of how he is building a harbor and container port in Uruguay to ship goods from around the world to Uruguay, and then distribute them by truck to all of South America. I told him that I do not have so much business know-how but I do have technical knowledge. He said that different countries have different laws. We have to tear down those boundaries, but we have to be careful that international organized crime such as the Mafia do not take over when that occurs. Then Father suggested that we go to the living room. There, a few more people had gathered again. Father seemed very inspired and announced, "We should have the next conference via Internet. Is that possible?" " Yes, it is possible" I replied. "You should build a network of people worldwide," he said. "Yes, I have that already," I said. Then Rev. Kwak and Mr. Joo came in and reported on the Hoon Dok Hae Conference. We were served refreshments during this time, and then at about 10:30 pm, the meeting broke up and Father went upstairs. I went down to help Peter Kim and Tim Elder with the speech, but I tried to rest on the couch. They woke me up a few times to get help setting up the printer, and various other things, and then I slept until about 4 am or 5 am. We gathered in the living room for Hoon Dok Hae, and I had the honor to read the speech America And God's Will from the Washington Monument rally on that same day, September 18 in 1976. I read the speech boldly and loud, and I was moved to tears, as were several other people in the room, including True Mother. After Hoon Dok Hae, I went home, and took care of a lot of errands. Then the next morning, Sunday, I got up at 3 am to be able to drive down to be with True Parents for pledge service at 5 am again. I brought my 13 year old daughter Nicole with me this time, as well as Rev. Yang's children. Father spoke mainly to the second generation kids, most over 15, a few younger. He said he wants them to be willing to be matched with other blessed children from the third world, of any race. Among other things, he mentioned that he is having many 22,500 Japanese UC members come to America soon. Then I went home to have church at my home for our community, then in the evening, I came down to the conference for the final banquet, and to hear Father speak. I was able to get admission, and heard him give the speech God's Fatherland but this time, it was Tim Elder's translation, which gives it quite a different flavor from the previous translation. The audience was very receptive to the speech, and applauded many times. This was refreshing since the majority of the audience were guests. This made me feel very good that finally, the people of the world are understanding the immense value of Rev. Moon's teachings. After the event, True Parents flew back to New York, and so ended a weekend with True Parents. For those who consider this story mundane, please forgive me. For those who experience the great value of this great man Sun Myung Moon and the incredible things he has accomplished with his wife Mrs. Moon, I offer this story as a testimony of gratitude. The speech Rev. Moon gave exemplifies his incredible depth. He teaches here the value and power of loving one's enemy. 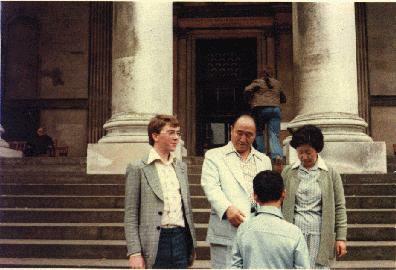 Fitzwilliam Museum, Cambridge, August 1978. 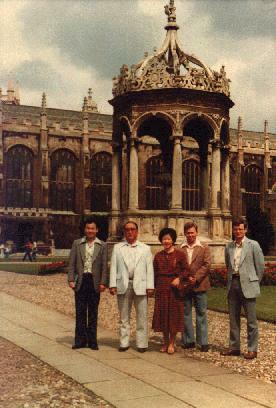 True Parents in Great Court, Trinity College, Cambridge, August 1978.